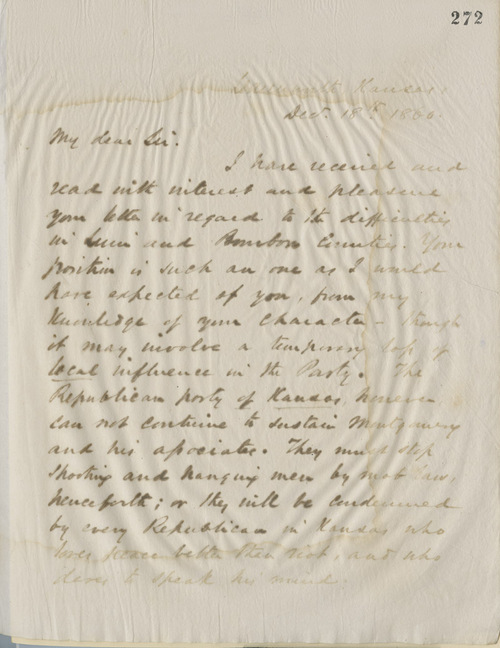 With regard to the "difficulties in Linn and Bourbon Counties," Ewing wrote William Riley Griffith of Marmaton, Bourbon County, regarding their shared belief that the Republican Party should not condone the violence perpetrated by James Montgomery and company. Ewing was hopeful that if Kansas was admitted soon, order would be restored. Ewing also makes several references to the administration of President-elect Abraham Lincoln.